Great News! Horny.sg has enabled more benefits for our valued customers. 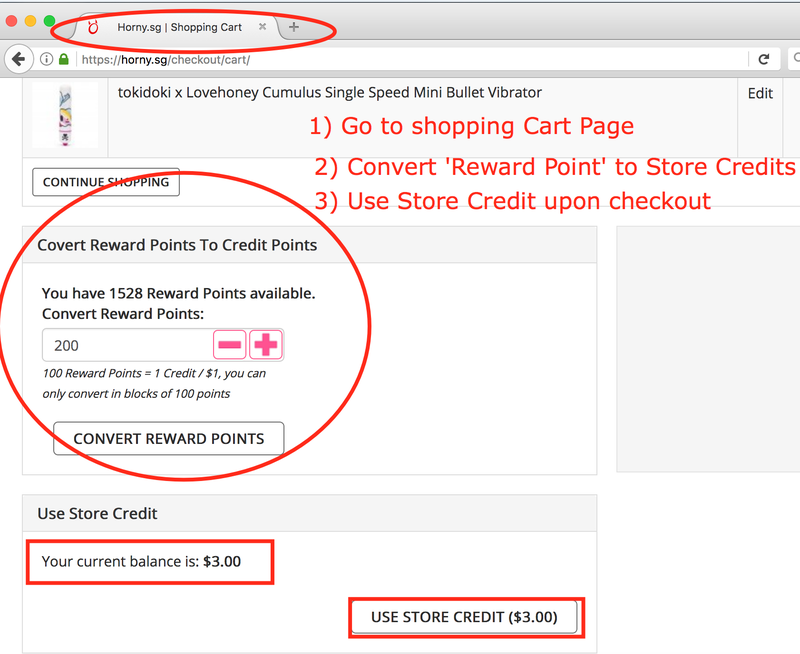 We have launched the reward points system that are convertable into actual store credits $ that can be used for your next purchase. For every 1 Singapore Dollar you spend, we will add 1x reward point in your account. You must be a Registered user and must be logged into your account when order is placed to receive points. If you don't have an account Sign Up Now ! Take a look at the Reward Charts at the bottom of this page. Valid for new customers only. By registering for an account at Horny.sg , you will automatically be given 100 points as a Welome Gesture. We will not modify the content in order to reflect the true ratings of each product. We want honest and accurate reviews that could be helpful to others. Please refrain from entering vulgar languge or expression, or one liner reviews telling people that "IT IS Crap!!!" with no further explanation. Once the review is approved, your account will receive 25 points. You can receive up to 100 points per day on writing reviews. 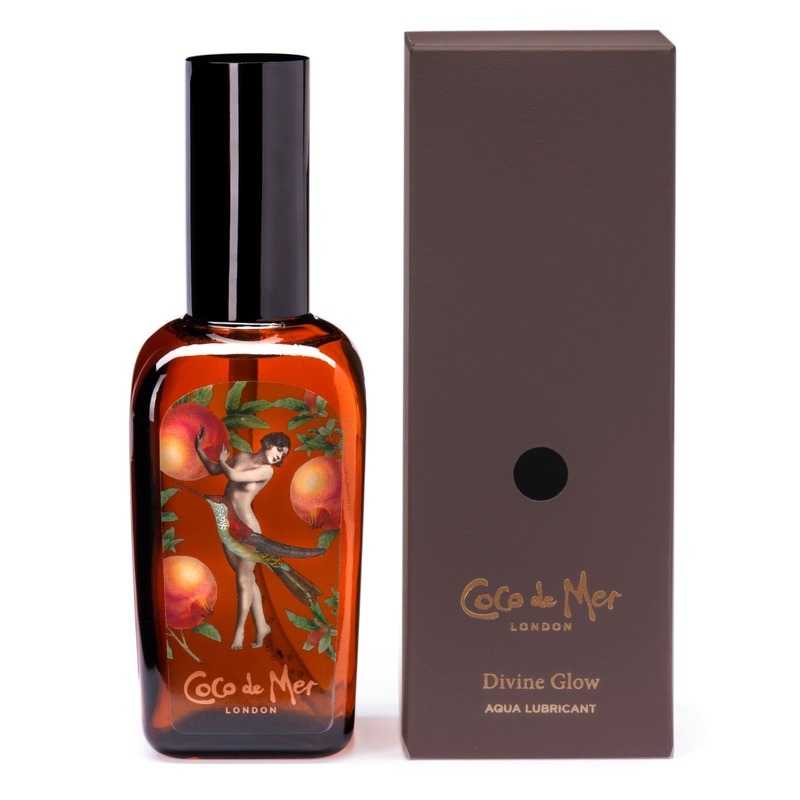 *Please note that you will not receive additional reward points for submitting multiple reviews to the same product. We are hope that this will generate interest and sharing in Social Media. However, if we find there's abnormal amounts of spamming or spamming using fake accounts, we will remove the points in that respective account and possibly terminate the whole program. Can I use reward points directly to offset / pay for my orders? 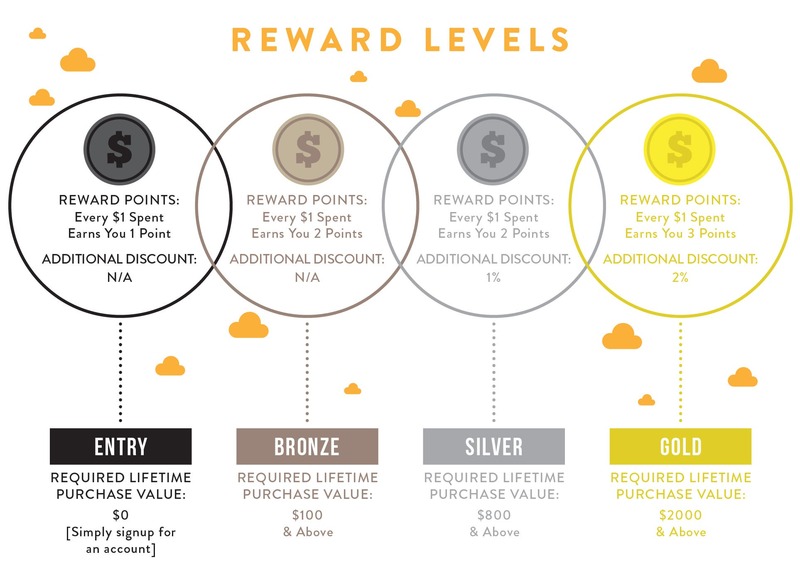 You will have to convert reward points to store credit before you could use it. 1x Store Credit is = to 1x Singapore Dollar . Store Credits do not expire but Rewards Points will expire after 365 days from the day you earn them. So make sure you convert them! How do I convert reward points to store credits? You have to logon to your account. After you have selected items fo your new purchase, go to your shopping cart and you will see Reward Points availabe to Convert. Enter the number of reward points to be converted to Store credits. One Store credit requires 100 reward points, and you can only convert in blocks of 100 points. If you have any question(s), we are just a livechat/ email away. What happens to the remaining credits that are not used? For refunded products how should it be treated? Your unused store credit will always be in your acccount until you use it. There is no expiry date for Store Credit balances and you can keep it for as long as you like. Can I apply discount code and use 'Store Credits' to make my purchase? Can I pay for shipping with my store credits? 10 days ago you registered your account for 100 points. Today, you make a purchase and awarded 50 points. Your Reward Points balance is now at 150 points. The 100 points you received for account registration will expire in 355 days since 10 days have passed. The 50 points that you received from the purchase is still valid for 365 days. Convert your points into store credits as soon as possible to avoid expiry! Can I use my reward points/ store credit to purchase a gift card? Do I earn addtional reward points when using a credits to pay for an order? How to redeem Store Credits? Using store credit is as easy as paying from your E-wallet. As long as you are signed in and have credits in your account, you will be given a choice to spend your credits while you are in the shopping cart or at checkout. Simply choose how many credits you would like to use - it is all up to you. Reward Points and Store Credits have no monetary value and cannot be used for any purpose other than redeeming products sold in Horny.sg. Both Reward Points and Store credits will not be available to be refunded for their cash value. We may from time to time adjust your points and credit account in respect to accounting errors, multiple accounts, refunds issued, products returned or suspected fraud, for which we have full authority. We reserves the right to take away any points or delete your account without notice if we feel that an account has been abusing or spamming in order to receive extra reward points or store credits. You can earn up to 3 Points Per $ Spent as a Gold Member with a 2% overriding discount on all purchases. For more information, see below under "Loyalty Program"
The program is Simple and FREE! Registered customers are split into Membership Levels based on your Lifetime Purchase. The more you purchased, the Higher the Level, the Better the Rewards! You will see your current order stats and how much you need to move on to the next Level. The % discount will be automatically applied in the Shopping Cart total. Please note - only orders with "Completed" status will be awarded the reward points, updated into your lifetime cumulative purchase amount. You will be able to see clearly the total amount of lifetime purchase under the 'Loyalty Program Tab' after logging in, and will be able to tell straight away how far away you are from the next level. Be sure to check back from time to time as the member benefits will change on a monthly basis! *Only orders purchased on a registered account can be calculated, so please register now if you haven't already! Horny.sg reserves the right to remove member status or cancel the program if we find dishonest use or abuse.